Michael has played extensively in hospitals and nursing homes, bringing healing music and to patients, nurses, doctors and other staff. 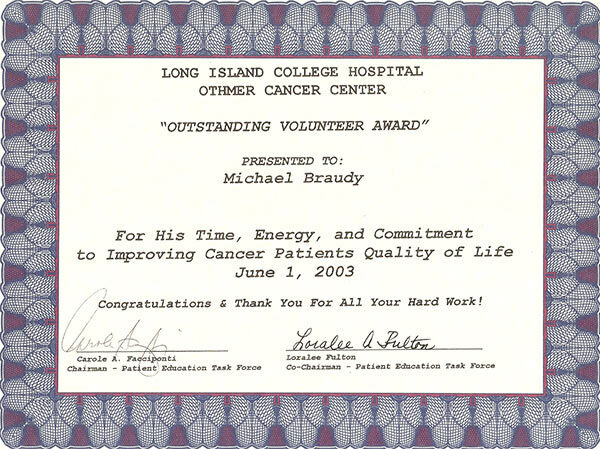 From 2002 to 2003 he was a volunteer in the Othmer Cancer Center at Long Island College Hospital (LICH), playing in patient rooms in adult and children oncology. He also played for people awaiting radiation, and for individuals while receiving chemotherapy. The staff commented that they liked the music too, to calm them and reduce their stress. While he was playing in one patient room, a doctor called “Come out here in the hall and play for us. We need it too!” For his service, Michael received the “Outstanding Volunteer Award” in June, 2003. Michael twice attended the Arts in Medicine Symposium given by the Society of Arts in Healthcare (SAH) at Shands Hospital in Gainesville, Florida. He played violin in the hospital rooms with dancer/artist-in-residence Jill Sonke. He is currently a member of the New York City Regional Arts in Healthcare. His bedside violin in health care facilities included playing at the bedside of a friend after brain surgery at the Rusk Institute during Autumn 2011.